At this point in the blog post, Miriam will likely have introduced me in some way. In any case, hello readers of Miriam’s blog, and anyone else who may have stumbled upon this post. So as Miriam may have mentioned, I am a law student at Penn, and a pretty busy one at that. [Miriam’s note: True story – she’s very busy!] This semester, I decided it would be a good idea to do an internship in DC and commute there from Philly twice a week. Shockingly, I am now incredibly busy, and living in two cities at the same time. One of the things I love about Shabbat is that it forces me to take a break from my life and just enjoy whatever company I might have, be it friends, family, or myself. In that context, this Shabbat was pretty close to perfect. Dinner was at the Gershman Y, which was doing a special program around the Scottsboro Boys musical, currently playing at Philadelphia Theater Company. Being the kind of law student who is interested in the Scottsboro Boys, I was intrigued, and a few others decided to come too. The food was okay, but nothing to necessarily write home or blog about. I hear the gefilte fish was the hit of the night, but I wasn’t in a gefilte mood, so all I can write about is the chicken. On a scale of greasy/grisley Hillel chicken to gourmet? Somewhere in the boringly average middle. Not one person I knew brought any wine to the meal, and yet, somewhere over the course of dinner we decided to create two new Jewish musicals: “Halacha” and “Minhag.” Perhaps you had to be there? alcohol, but the funfetti cupcakes were funfetti – tastic, and the chocolate cheesecake brownies (eaten three hours after the meat consumption, of course) were pretty amazing. I also learned that if you pick the right pictures, Taylor Lautner and Kris Humphries look remarkably similar. 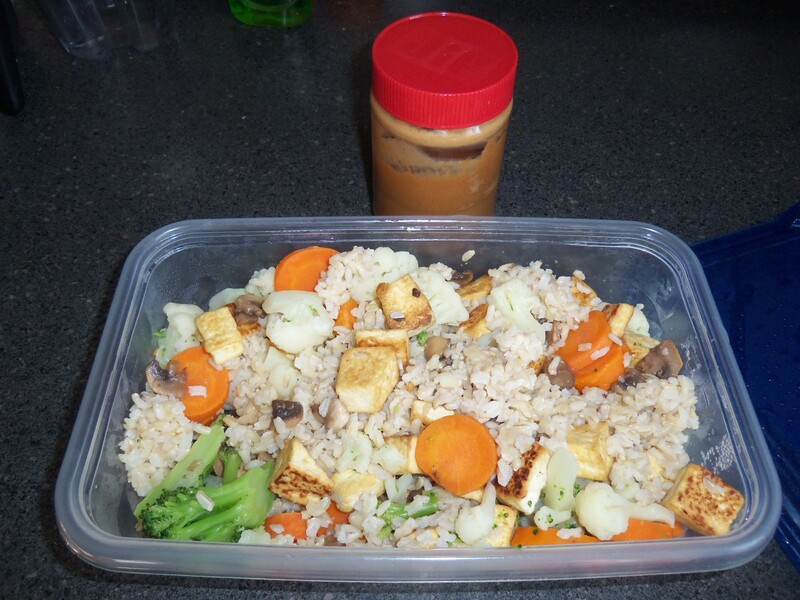 at my house, and I will happily whip up tofu for you to eat!). I decided to go all out, and made two kinds of meat: BBQ Brisket in my crock pot (easiest recipe in the world at the end of this post), and honey mustard chicken. I also made (for the first time) parve mashed potatoes, green beans, and a decent but not great pumpkin soup. 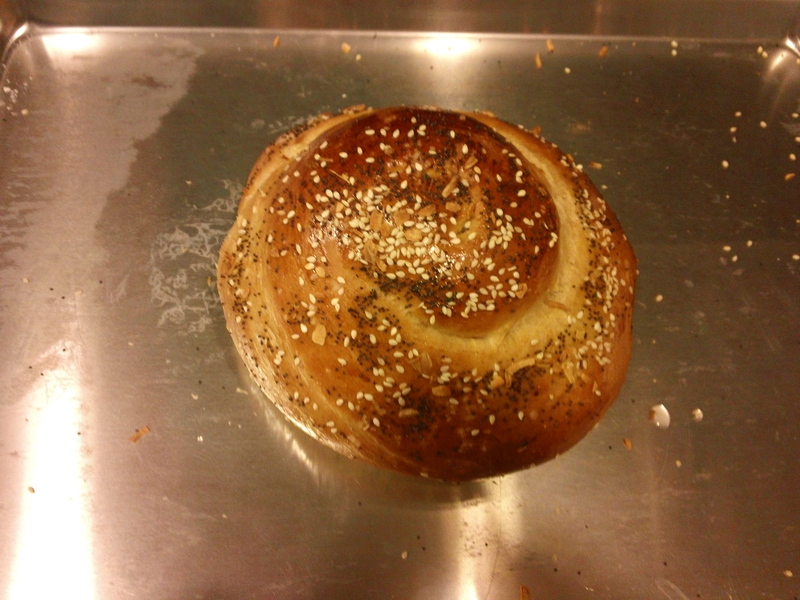 Jo made delicous challah, and Belina contributed a yummy salad of mizuna, onions, and dried cranberries. It may have been the first time I ever ate mizuna, in fact. The rest of the meal was a blur, as often happens when I host, but I think everyone enjoyed themselves and the food. Dessert was i can’t believe its parve ice cream courtesy of Sara, and it all got devoured. Lunch blended into Shabbos afternoon, and a lovely visit from Susie and Mike. We played Settlers of Catan until the sun went down, which was, like the rest of Shabbat, perfection. Okay, so this blog is about recipes [Miriam’s note: But also about a lot of other things! ], so I will leave you with the easiest brisket in the world (and, since I am currently on a bus to DC and don’t have any pictures to provide, Miriam, a picture of Aliza?). Put Brisket and BBQ sauce in a crockpot. Set on low, leave and enjoy life for 7 – 9 hours. (or if you are cooking it overnight like I did, sleep for 7- 9 hours). I added a tiny bit of hot sauce, but that’s not necessary. Depending on how much sauce you use and how long you cook it, you can pull it apart, let it fall apart, or leave it whole and slice it. Or sometimes, the crockpot decides these things for you. In Joline’s honor, why don’t you sign up to blog for a week? This week, we get to hear from Alex, the kallah (bride). Mazel tov! Truly, getting to celebrate with Alex and Jonathan at their wedding was an absolute joy, and having their sheva brachot Shabbat chronicled here is a definite privilege. Just because the only picture here right now is of chili, everyone and everything at the wedding was beautiful, and hopefully I’ll be able to update this post with a picture of the festivities in the near future. On a personal note, writing about my own Shabbat meals is a habit that’s proving hard to break. I went to four Shabbat dinners on Friday, and I spent much of the time going between them thinking about how I’d write about my night. But my last meal of the night was at Ilana’s with the newlyweds, and this might be the first Shabbat of my entire life where I ate red meat for dinner and again for lunch. Jonathan gets an extra mazel tov for that one. For the regular readers of this blog, a few months ago, you read about us getting engaged; now six months later we’re celebrating our first Shabbat as newlyweds. During the Jewish wedding ceremony the sheva brachot (seven blessings) are recited and are then repeated at festive meals for a week following the wedding to allow you to celebrate with the larger community. 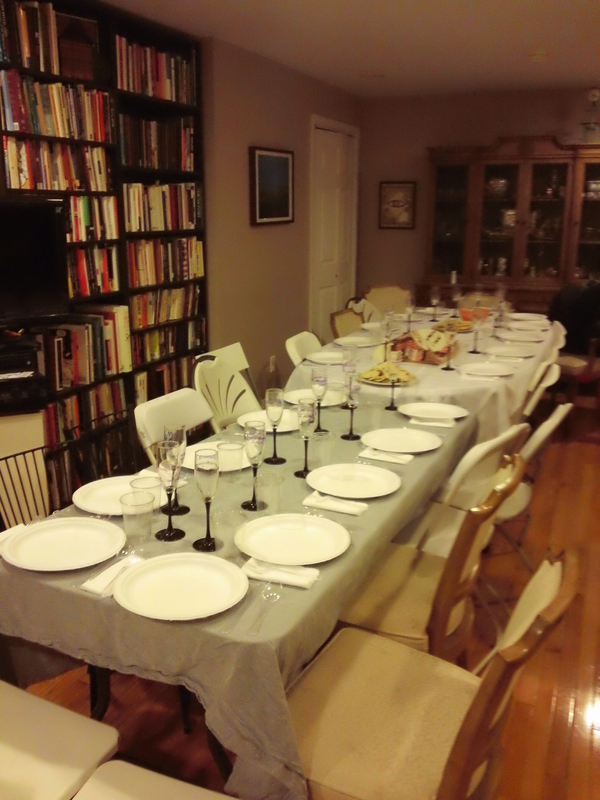 Our favorite matchmakers, Miriam and Ilana, each were kind enough to host a sheva brachot meal for us this week. Jumping to Friday night, Ilana hosted us for a wonderful Shabbat dinner. We started off the meal with Beverly’s challah (dipped in honey instead of salt—a wonderful post-wedding tradition) with hummus and guacamole. The main course was meatloaf with mashed potatoes, roasted Brussels sprouts, stuffing, green bean casserole and tofu for the vegetarians at the table. I’ve never had meatloaf before and previously wasn’t particularly interested in it. I was wrong! This meatloaf blew away all my preconceived notions of meatloaf. It was moist and flavorful, and has convinced me to reconsider my position on meatloaf. 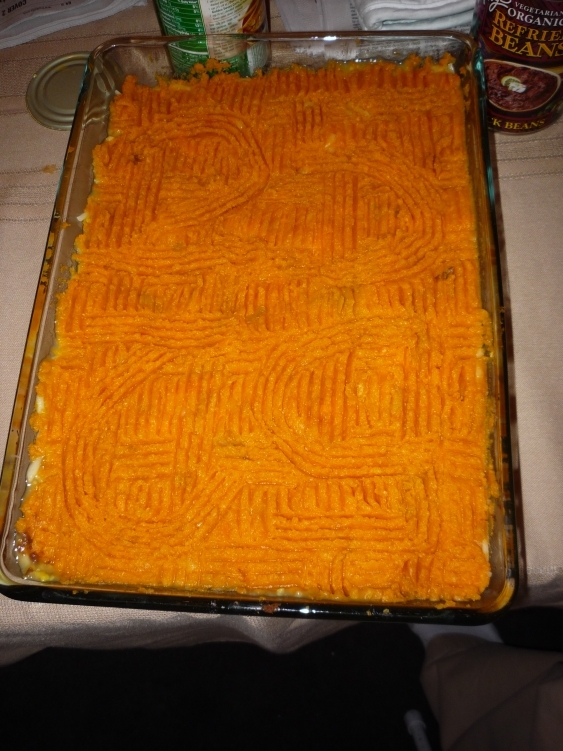 However, even better, was the totally not-parve tasting mashed potatoes. Apparently the secret to making parve mashed potatoes good is adding A LOT of margarine and Coffee Rich creamer. I’m totally stealing this trick. For Shabbat lunch we wanted to thank some of the people who had hosted us this past week by having them over for lunch. The wintery mix (that thankfully held off until after our wedding weekend) meant breaking in our brand new crock pot for beef chili. Jonathan had been promising beef chili to Miriam since her conversion from vegetarian to not-so-vegetarian. 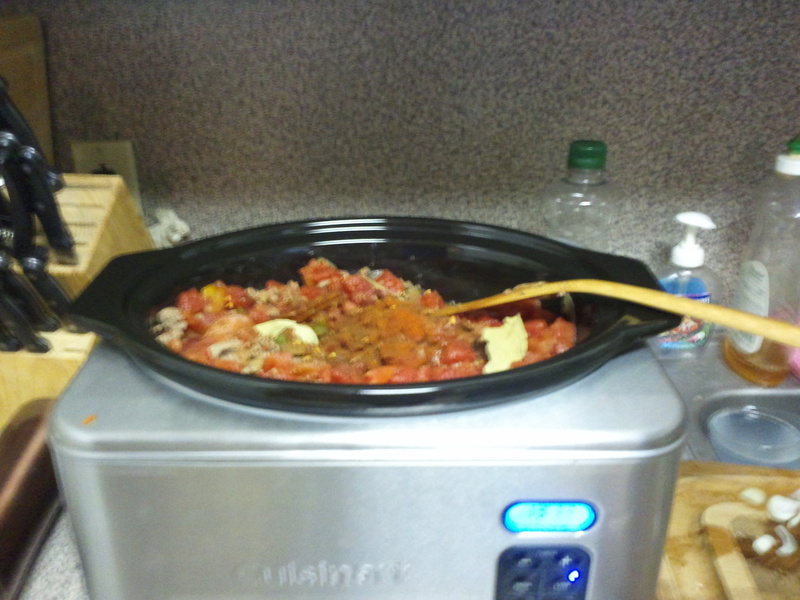 A 6 ½ quart crock pot (with 3 pounds of beef in it) awaited her arrival. – Alternatively just add the entire contents of your spice cabinet. – Simmer for 1 to 12 hours. In the crock pot we did 13 hours of cooking on low with 8 hours of being kept warm, while re-seasoning every few hours. To counteract the intenseness of the chili, we started with a salad of baby spinach, green pepper, green beans, tomatoes and almonds and roasted cauliflower with a Dijon mustard glaze. In cooking the cauliflower, I had my usual round of “is there going to be enough food?! 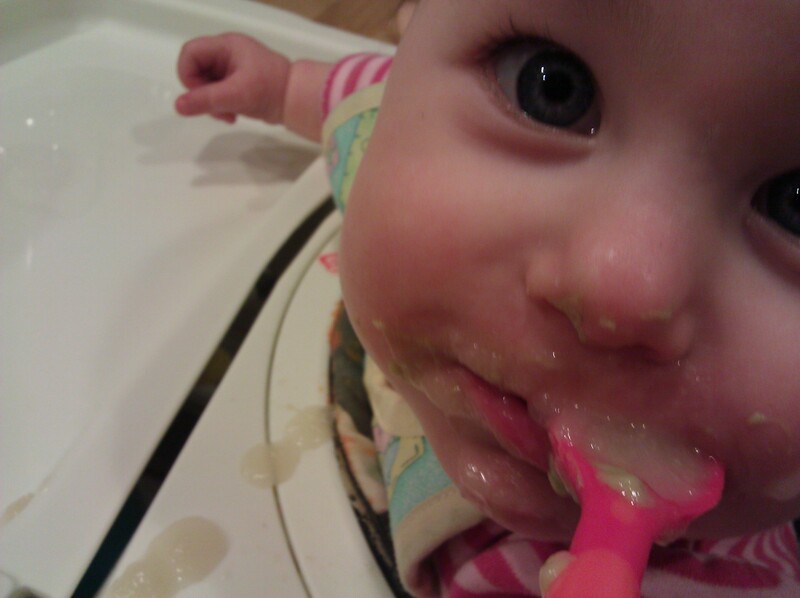 ?” This is a common theme in Miriam’s blog posts and with everyone who cooks Shabbat meals regularly. I might suggest re-naming the blog, “Food Anxiety: How much food do I need for a Shabbat meal.” For dessert, I made a lemon pie and there were peanut butter-marshmallow fluff-brownies courtesy of Dalia from Wednesday night’s Sheva Brachot meal. Lunch wrapped up around 4 so by the time we took our Shabbat nap it was time for havdallah ending our great first married Shabbat. 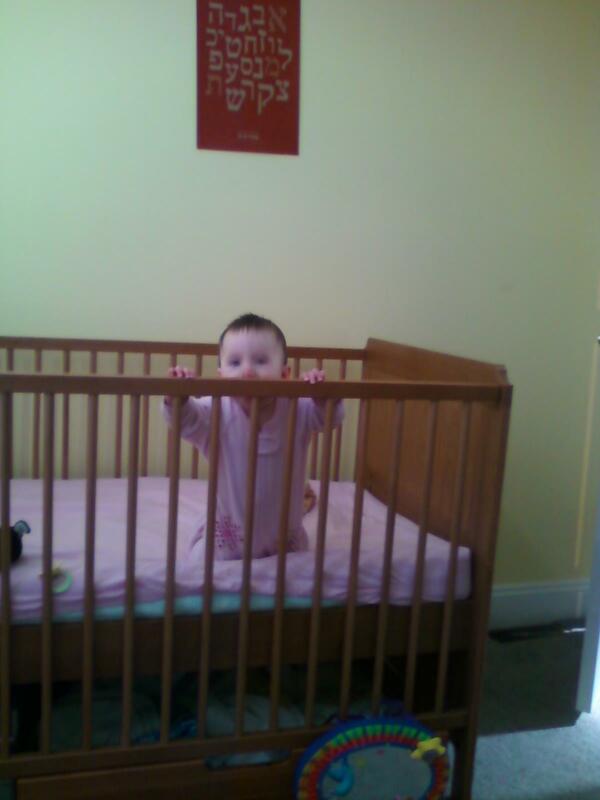 Naomi is our guest blogger this week. You might remember her from, well, pretty much every meal I ate around the time Aliza was born, and many meals before and since, plus one notable time that I compared her to an angel. She praises her friends many in times in the post, though I continue to think I’m the one who should be offering the praise for Naomi and all my other friends who have been part of this project. Speaking of which, click here to sign up for a week to blog! And, speaking of projects, check out my new blog/advice column for the Jewish Exponent: Miriam’s Advice Well. Please submit questions!! And now, without further ado or self-promotion…Naomi’s post! For my turn on this blog thing, I said I’d write when there was Heymish, because I knew that there would be lots of good food and company to talk about. And so after several slightly confusing emails with Miriam and Warren and Beverly (while she was in Israel), we decided that Heymish, and therefore my blogging turn, should be this weekend. Which all worked out beautifully except for one small issue: In a highly unusual turn of events, I didn’t cook one single solitary thing. But that’s ok! Because Miriam said we didn’t have to cook to blog, and I did eat a lot. Plus I have things to say, and you are here reading them. All of which is to say that you’re stuck with me, for this week anyway. And remember how I said I didn’t cook? 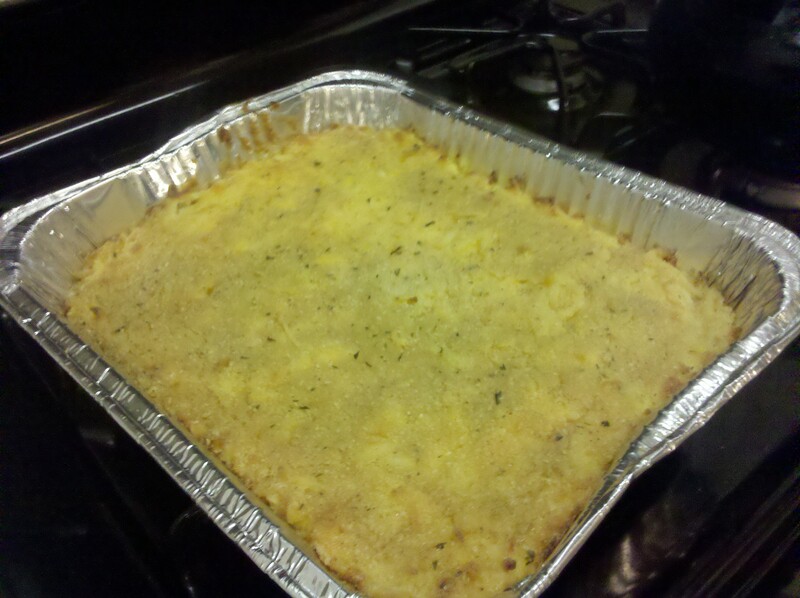 Well, my contribution to the potluck was paper goods to eat it all on. This is actually a very important ingredient to a successful meal. (At least usually, though I happen to have had a memorable meal without those things.) And also I cleaned my living room and set up chairs, so really I did help make eating happen. And that was my evening. But Shabbat wasn’t over yet. Because it always keeps going till the stars come out on Saturday. But also the Shabbat fun wasn’t over yet, which is what I meant to say in the first place. And that is because it was also a Tikvah weekend. eating burritos every night. Yum. And that about wraps it up! [Miriam’s note: burrito pun intended?] I think the moral is that food and prayer are fun community activities. But the moral might be that I have awesome friends (and especially an awesome fiancée) who make it possible to have a hard week at work and not have to cook every week to have Shabbat meals. And the other moral might be that I love it when Heymish and Tikvah weeks line up just right. Although the moral could be that when it’s your turn to write on this blog you’ll get to ramble as much as you want, like I did. Take your pick. For the first post of this new year, our blogger du jour is someone you’ve already heard a lot about: husband, father, and ice cream creator extraordinaire, Marc. He has a lot of nice things to say, and he planned a really great birthday weekend for me. But there were a ton of poppy seeds in the house; he just didn’t know where to find them. And the absence of chana masala at my Indian food birthday party was totally deliberate — he let my successful cholent masala from last week have the last word. Also, he does not do the potato dish justice. It was that good. Well. It’s about time. Miriam wrote her blog for just over a year, and now she’s handing it off. To us. First, to me. And that means I get to dish! Three. Aliza happens to love the blog, and she usually likes (at least the smell of) the standard Chefbot options, but she thinks that the WordPress interface leaves a lot to be desired. All right. On to this recent weekend. It was Miriam’s birthday! Hooray! I wanted to take the opportunity to help make her life the way she wants it to be. Which of course we try to do for each other all the time, but a birthday is a good time to redouble efforts. And, as pertains to this current article, that includes meals. For Saturday, Miriam requested the company of Beverly and Naomi. And they went for it. Great! Beverly just got back from Israel this week, and we hardly ever have such a small meal. It’s hard not to start to include more and more people, but when you make an effort – a real effort – a small meal is possible. Indeed, the progression of meals went from 2 (me and Miriam, described above), to 4 (me, Miriam, Beverly, and Naomi) to 16 (Saturday night, to be described below.) This means the next meal would have to have had 256 people, and the one after that, 65,536 Yikes. Have you ever tried cooking for 65,536? This is beyond the means of even Chefbot 4000. Especially for soup. So Saturday day, we had tacos. It’s easy – just put out taco components, and tell people it’s a meal. It’s like opening your refrigerator and saying “enjoy the fusion buffet.” Even better, change out the fridge light for a colored “party light” and play some techno in the background and they’ll line up. All right. Saturday day very pleasant. Then a nice walk around town, pleasant weather. Funny for January 7, but very nice. Thanks, weather. And then, home for the big birthday bash: Indian food! Weeks before, Miriam requested “Indian” food for her birthday. I knew she meant the subcontinent of India, not Native American cuisine, mainly because we eat and enjoy Asian-Indian food now and then, but never Native American cuisine. (Save for popcorn, OF COURSE). I had sent out an email asking people to bring Indian food if they wanted. I called it something like a “Malava Malka Birthday Party.” Malava Malka is a fun meal after Shabbat. Having a meal after Shabbat time is a lot less stressful than Shabbat meals in some ways — people can cook, use appliances, buy ingredients they forgot, ring the doorbell, put on music. And, Saturday night is still very much the weekend in these parts, so both observant and non-observant people are typically in a pleasant, non-work state of mind. Saturday night is as far from work as one typically gets. So it’s the best of both worlds! In addition, I planned to 1) microwave a bunch of prepackaged Indian food bags, and 2) cook some things after sundown (after sundown so observant people could join in the cooking fun). I ran across a nice-looking Indian cookbook and bought it, and asked Miriam to pick out one recipe that we would make. She chose “Alo Korma.” I love Alo, and I love Korma (usually chicken), so this sounded great! Earlier in the week, we went to the Indian/Pakistani grocery on forty something and Walnut near the Restaurant School where I used to teach and picked out relevant ingredients. I got the rest from Whole Foods, and Saturday night, it was on! Rebecca brought ingredients to replicate last week’s Champagne Punch. Mattea, who brought Roti, helped a ton cutting potatoes and measuring out and roasting spices, and Ilana and Ariel relieved in about the fifth and successfully closed. 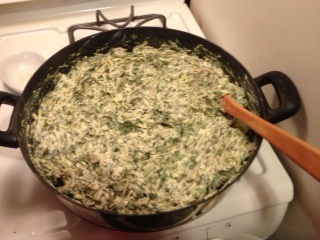 I made a huge heaping ton of rice; Yael and David-Zvi brought some yummy potatoes and peas; and Ilana brought an excellent rice pudding, the leftovers of which are the most recent thing I’ve eaten at the time of writing. and I added Cayenne at the end, to taste. 1. Whisk the yogurt with the roasted paste. Mix well. 2. Heat the ghee; reduce the heat, add onions, ginger, and garlic pastes. Fry until golden brown. 3. Add the potatoes and ry until golden brown. Add the yogurt mixture and salt. Cook for 5 minutes and add 3/4 cup of warm water. Bring to a boil, reduce heat and cook until the potatoes are tender and the gravy is thick. And I feel fine! Better than fine, in fact! 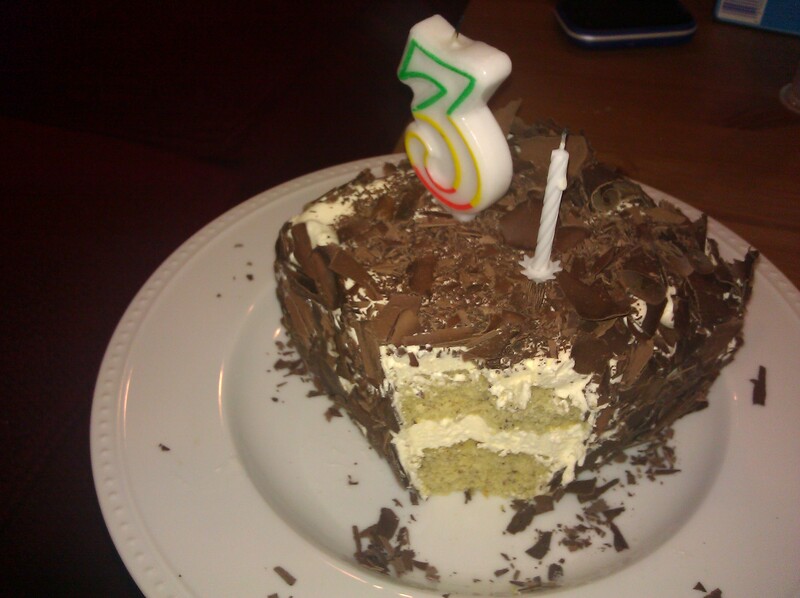 It’s been an amazing year, a crazy year, and a really, really exhausting year, but I turned 30, I had a baby, I made a lot of food and a lot of messes, I wrote about all my Shabbat meals for the whole year, and I lived to tell about it. And now, it’s in your hands. Ok, our hands. The blog is going to continue in 2012, but this year, a different person is going to write the post for each Shabbat. I’m still going to be putting it all together, but other people are going to be sharing their experiences. 1) Write about your Shabbat experience in 300-700 words. 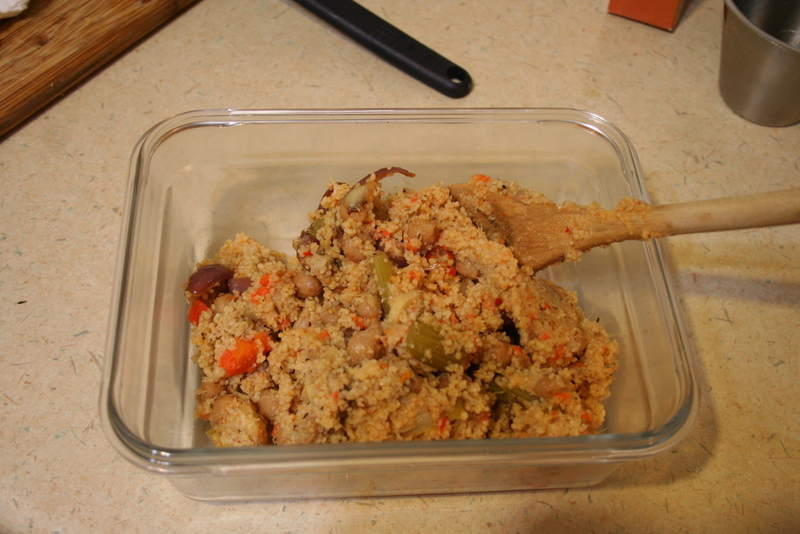 2) Include a recipe (doesn’t have to be something you made that week – could just be something you like to eat!). 3) Include a photograph of food or something else related to your Shabbat experience. 4) Refer to people by first-name only, and try to ask their permission first. 5) Send me your piece by 10:00 p.m. Sunday night for posting. 6) This is a low pressure situation. I want people to participate because I’ve had fun doing this and I think you will, too. I want to demystify Shabbat, encourage people to cook more, and contribute to my friends and my community and my ever-enlarging circle of people taking care of themselves and each other. You don’t have to be a gourmet cook or an accomplished writer. You just have to have an openness that you’re willing to share. Or be a curmudgeon and share. That works, too. My list of other thoughts about your participation is at this post if you want more context. I’ve thought a lot about how to wrap this up, and I’ve come up with a lot of variations. But here’s the one I like best: I don’t have to! This past year’s project has set the stage for other things to happen, but I’m not totally bowing out, and even after all this writing, one of my favorite things about Shabbat continues to be the fact that it happens every. single. week. It will after the blog is done, and even after I’m done. I don’t need a conclusion about Shabbat because nothing is concluding. Thanks for reading. Thanks for eating. Thanks for putting up with me writing about you, the intricacies of various facets of the Philadelphia Jewish community, the complexities of making ice cream, and a lot of recipes including chickpeas. Thanks for gushing at all the pictures of Aliza. I hope you learned something. I hope you felt inspired. I hope you felt connected. 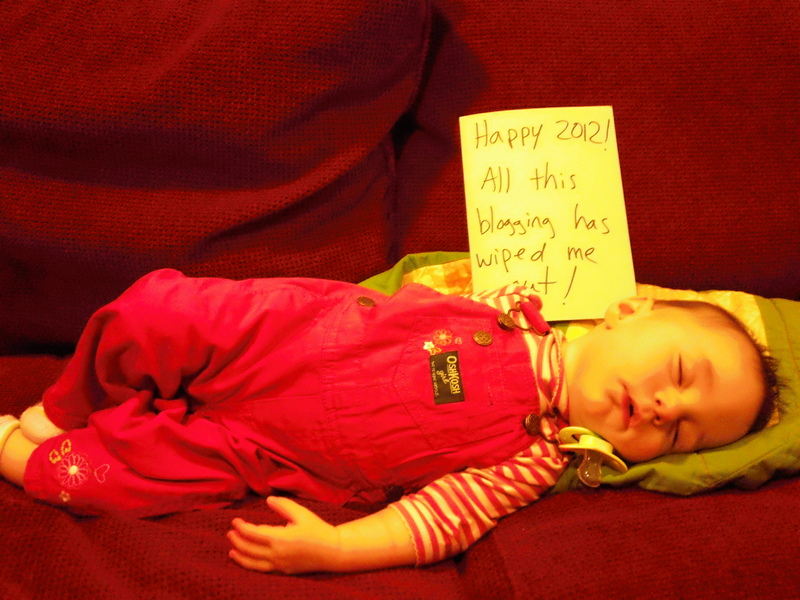 And I hope you’ll share your own Shabbat experiences in 2012! Underneath the main chorus at the end of the afore-alluded-to song, there’s another phrase that gets repeated over and over again: “Time I had some time alone…” That also resonates with me, and I’m considering a short hiatus from hosting meals. It might not happen. It probably won’t happen. But I feel fine. If my blog were a sitcom, this would be the clips show. Whereas the conceit for Friday night was that everyone else should make their most impressive dish, my plan for Saturday lunch was that I would make the best of from the past year of my own cooking. In reality, lunch turned out to be a combination of that plan plus cooking with phyllo dough, something I’d wanted to do all year and never got around to. Carrot ginger soup – This actually never made it into the blog, but I made it for myself a few weeks ago and couldn’t get enough, plus, it’s as easy as it gets: saute some chopped onions or shallots in oil and/or butter. 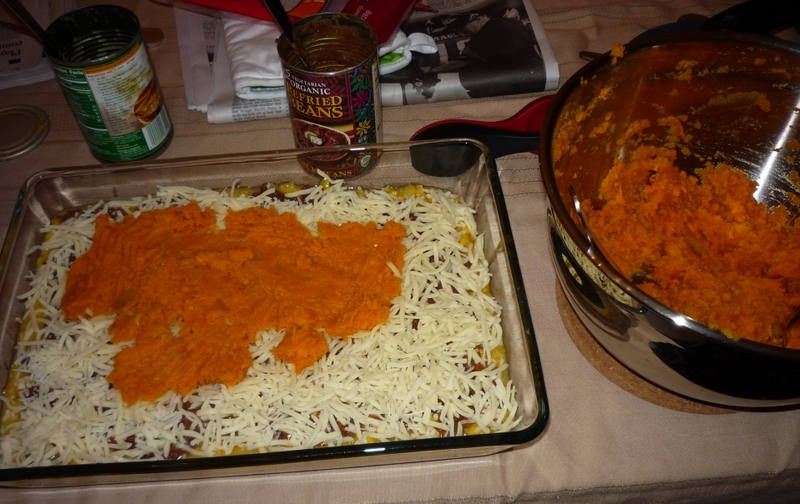 Add a pound or so of chopped carrots and saute a while longer. Add 4-6 cups of vegetable broth, bring to a boil and let simmer. When the carrots are tender, turn it off and blend it with an immersion blender (use caution if using a regular blender – learn from my mistakes!). Add salt and pepper to taste. Serve hot or cold. 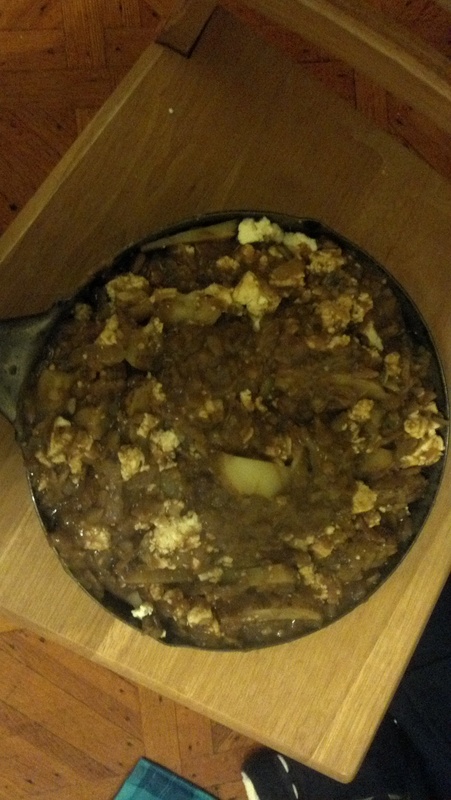 Cholent masala (an advanced draft) – I really, really wanted to get this right before the blog ended. I wouldn’t say it tasted restaurant grade, or that I could ever recreate exactly what I did, but it had the right consistency, and that in itself was a huge accomplishment. 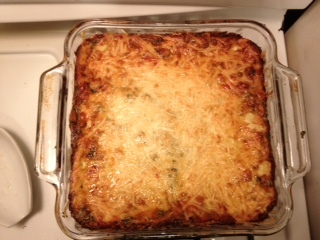 I cooked it on high for about 8 hours, low for another 5, and then kept it on warm all night. I also spiced it right before serving and used a crazy amount of curry and garam masala. And though I couldn’t find kosher-certified tamarind paste or powdered mango, I used a healthy dose of lemon juice, and it really worked. Sesame noodles – Always good. Always a crowd-pleaser. 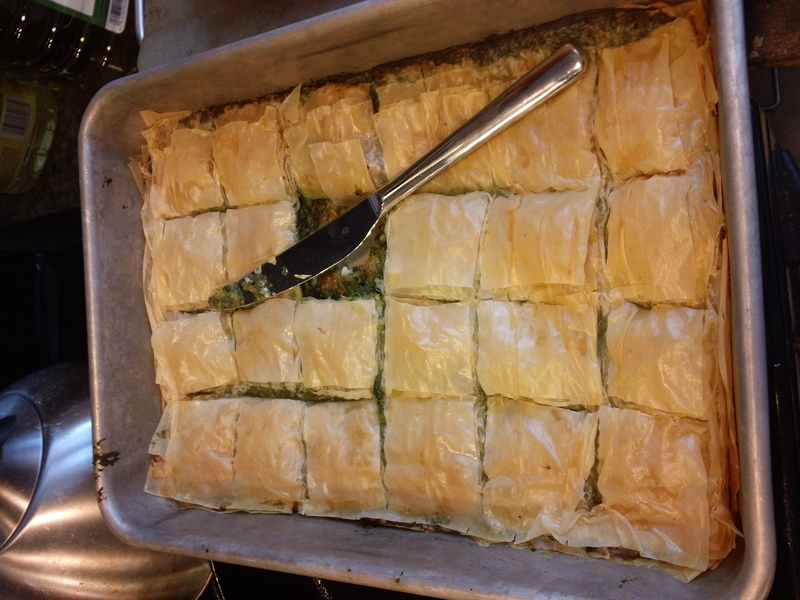 Spanikopita – I made spanikopita filling way back last January, and I had phyllo dough in the freezer for pretty much the entire year, but I never managed to put them together. 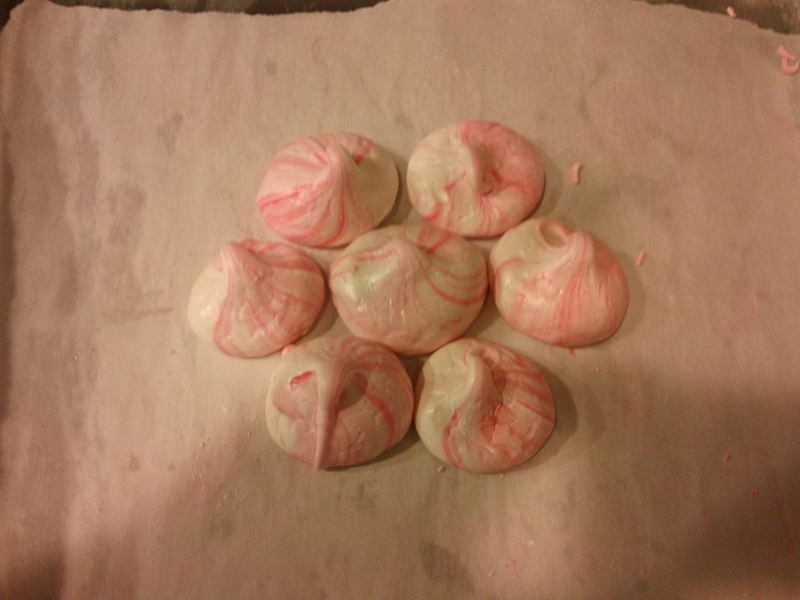 Using up the dough was a blog ending requirement. Turns out there was twice as much in the package as I needed, and it’s still sitting in the fridge. Basically, I made the filling then sandwiched it between two layers each made of five sheets of phyllo dough, which Mattea helped keep damp until I was done brushing the previous layer with olive oil. For sure the texture would have been better right out of the oven (as it was when I tasted that square out of the middle) rather than cold the next day, but that was minor in comparison to my excitement at having conquered the project. Tzatziki – Goes so well with spanikopita and, thanks to its similarity to raita, with the cholent masala as well. Greek yogurt, lots of minced garlic, chopped cucumber, lemon juice, salt and pepper. Can’t get enough of it. 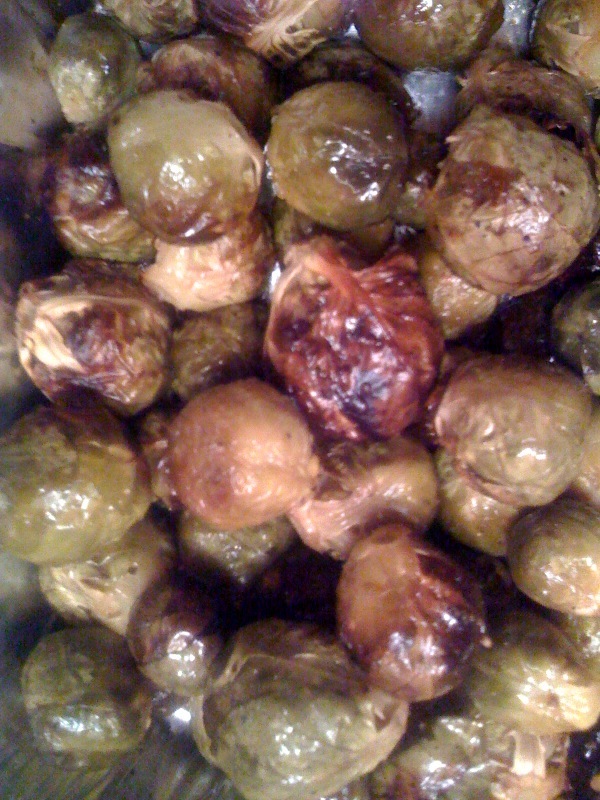 Skordalia pie – When I g-chatted Alex at 11:00 Thursday night to ask what else should go with the planned menu, I was thinking veggies, something light, certainly not another olive oil-laden phyllo pie. Yet, making something that didn’t require another trip to the store and that would use up more of that pesky dough won out over all of Alex’s well-balanced suggestions. With Mattea and Rebecca, we made a mashed potato, caramelized onion, feta filling and prepared it the same as the spanikopita. And due to my previous success with skordalia, we decided to name it accordingly. 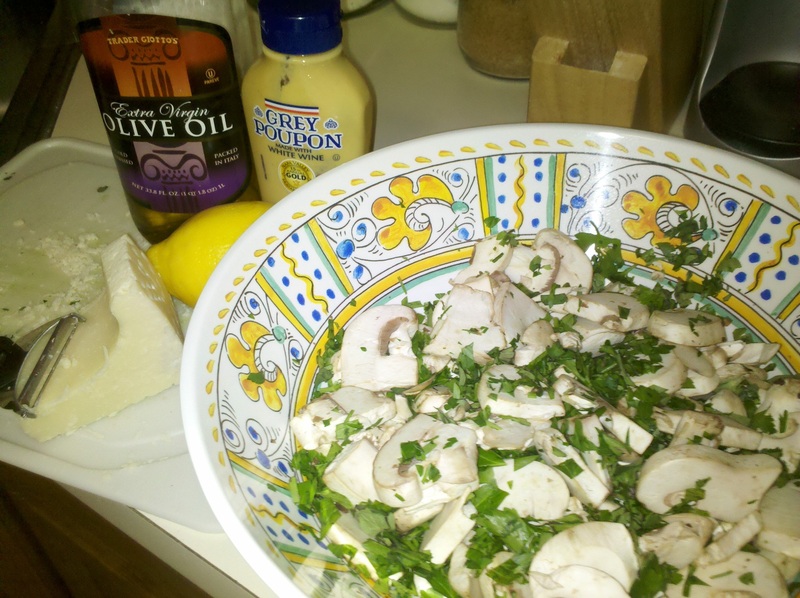 Leftovers – I really had not planned for this when I came up with the menu. There were so many leftovers from Friday that people wanted to keep sharing, that we basically had a whole other course of leftovers. 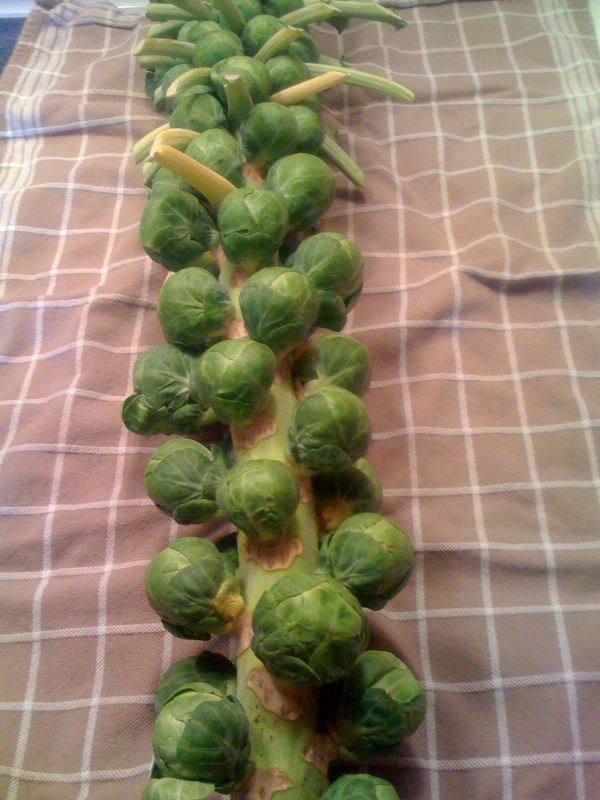 And, thanks to Ariel’s brussels sprouts, it worked out perfectly that I didn’t actually have a vegetable on the menu. Citrus shortbread cookies – The last time I made this, they were basil citrus cookies as per the actual recipe, but without the basil they went a bit better with the ice cream. As soon as people started leaving Friday night, we started resetting the table for Saturday. Marc said, “What if it were 12:30 on Saturday and lunch were about to start? Would we just go for it?” Given how baby-induced sleep deprivation has affected my sense of time, I was like, “yeah, sure, it’s lunch time.” But it wasn’t. There were only thirteen people for lunch (see this post for more on how I quantify small meals). Since everyone at lunch had been there the night before, I worried that people might be a little sick of each other, so I posed this conversation starter: Marc and I quest for finding the perfect chana masala in restaurants and also to be able to recreate it for ourselves at home. What foods do you quest for? I was glad to hear people’s responses and even gladder that actually no one seemed sick of each other at all and didn’t need me to facilitate conversation. At the end of lunch, we said birkat (grace after meals); I generally don’t remember to and thought it would be a good way to wrap up this year of meals. Then we went for a baby-nap-inducing walk, which essentially kicked everyone out. Shabbat ended in a couple hours anyway, and everyone had New Year’s Eve plans, so the timing was actually pretty great. And the food was great. And the company was great. And the year was great.